Students from the 2016 ROTC commissioning at Illinois State University. Illinois State University will hold its annual Veterans Day ceremony at noon Friday, November 11, in Prairie Room North of the Bone Student Center. The event is free and open to the public. Illinois State Army ROTC cadets will participate in the ceremony by posting the colors, singing the national anthem, and providing the invocation and benediction. Illinois State President Larry Dietz will deliver remarks to recognize and honor veterans. Following the ceremony, the audience is invited to proceed to the flagpole on the Quad for the laying of flowers and the playing of Taps. John M. Collett, retired Army Ranger and founder and president of Three Rangers Foundation, will be the guest speaker for the ceremony. 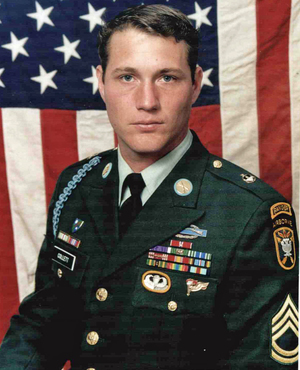 Collett earned a Bronze Star for valor and heroism after serving in Mogadishu, Somalia, in 1993, as part of a mission to capture top-ranking deputies of warlord Mohamed Farrah Aidid. After retiring from the Army, Collett was a military consultant and stuntman on the feature film Black Hawk Down, based on the crash of two U.S. helicopters and the death of American soldiers during the operation in Mogadishu. Three Rangers Foundation is a non-profit organization dedicated to empowering veterans to achieve lifelong success. Veterans may pick up commemorative yellow ribbons from 9 to 11 a.m. that morning in the Veterans Services office, 112 Moulton Hall, and at the entrance to the Prairie Room North prior to the ceremony. The ceremony is sponsored by Veterans and Military Services, Illinois State University Army ROTC, Veterans at Illinois State, Omega Delta Sigma Illinois State faculty/staff military affinity group, and the Office of the University Registrar.